The Corky & Company Facebook fan page, now six months new, has developed into an active social site with 1500 fans. 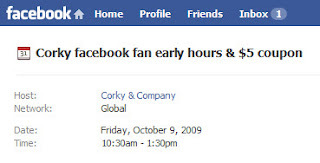 If you Facebook, you should check out Facebook.com/Corky and consider becoming a fan. It's a fun community moderated by Kim, our founder and head of design. See our new designs months before they're in stores, find hard to locate styles, upload photos of your favorite kids in their Corky coats, resolve problems and ask questions. If you live near our factory, just before our warehouse sale, we open for three hours exclusively for our Facebook fans. This may not seem such a big deal, but if you've ever attended the first sale day, you'll know the advantage of entering before the running of the shopping mommies. This year we also offered limited edition Corky ladies coats for sale exclusively on our Facebook page. Forever have our customers asked us to make ladies coats and this year we obliged. 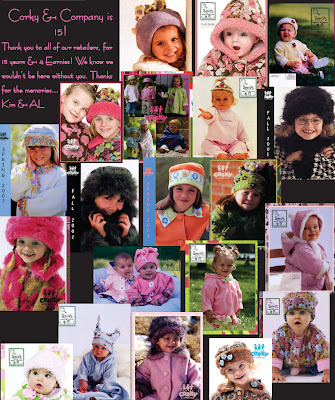 Special orders were taken, 25% of the proceeds donated to The Relay for Life and some very special coats were made for a few special customers. Our Facebook fans are always the first to see our new products. As soon as our photo shoot is done, we post the pictures in our Facebook album for our fans to enjoy. Thank you to all our fans; I love dropping in and reading your posts.